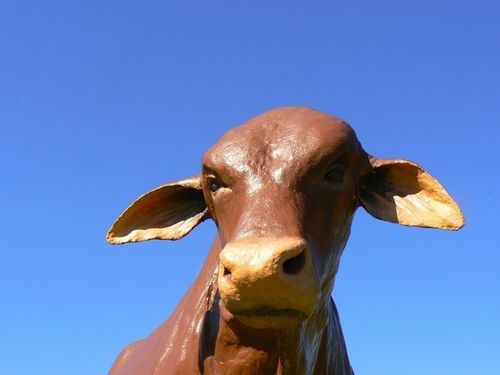 Statue to the Droughtmaster bull which originated from crossing the Brahman or Zebu bull with a British breed, and was a response to the arrival of the cattle tick in North Queensland in the 1890s. The monument also records the brands and names of sixteen studs which were associated with the development of the breed. DROUGHTMASTER STUD BREEDERS' SOCIETY. LTD.
" Australia's Own Cattle Breed Evolved In Queensland."